ZYGOCACTUS (SCHLUMBERGERA) X "WHITE CHRISTMAS"
By cultivating all the genera and species as indicated in the “botanical species and hybrids page, I have plants blooming nearly all year long in my collection. I notice less intense periods both in January-February and in August, and peaks of intense blooming both in April-May-June and in October-November-December. I think this result can still be improved in particular by counting on Rhipsalis that I haven’t repotted for many years because they are exceptionally robust plants; but, currently, they bloom in a sparse way, probably due to worn out compost and too much shady exposure. After several tests of different culture methods and observations of my successes and failures, the fundamental factors to obtain an abundant and vigorous blooming seem to be : light, temperature, nutritive supply of the compost and fertilizers, and last but not least, the summer stay outside the greenhouse ; I am more cautious about winter waterings. Many books recommend epiphytic cacti growing in a light-filtered location, avoiding direct sunlight, and even in shaded or semi-shaded locations. But, when one visits the tropical forests where botanical species grow, one realizes that the semi-shaded biotope virtually amounts to the bright Paris area sunlight. We also have to keep in mind that the window glasses of our greenhouses stop a very high percentage of the solar radiation in the ultraviolet spectrum whereas these rays are present in the biotope, (and I will not mention the non-epiphytic cacti which can be found in the Andes at such altitudes of 3,000 or 4,000 meters and which receive a quantity of ultraviolet rays impossible to obtain at home near Paris ; this problem is much less serious for the epiphytic species whose biotopes reach far lower altitudes). On the basis of what I had read and as I wasn't an expert on the subject, I started growing my epiphytes (botanical species and hybrids) in not very sunny parts of my greenhouse; I even used roof curtains to protect them from direct sunlight. Thus, I obtained a satisfying blooming for some plants (Zygocactus, Nopalxochia, some Epiphyllum) but a frankly disappointing one for others (especially for many Epiphyllum hybrids). Consequently, I decided to move these plants in sunnier places of the greenhouse. The result was stunning: appearance or noteworthy increase in blooming after the first winter in sunny location.To conclude on the matter, I would say that I very often observe an abundant blooming on the stems that are in the sun and an absence of blooming on the stems constantly in the shade on the same plant. The conclusion is obvious: one needs sun to get flowers. For a lot of epiphytic cacti, a fall of temperature in winter is necessary to obtain flowers in spring. I grew Disophyllum plants for one whole winter inside my house, in a place where the minimum temperature was about 16°C. I did not obtain any flower in spring . The same plants spent the following winters in my cold greenhouse where the minimal temperature is around 10°C. Since this location change, every spring these plants are covered with a very abundant blooming. I keep this minimal temperature of 10°C as a precaution for some botanical species known as sensitive to cold but I think that I could let the temperature fall to 5°C for almost all my epiphytic cacti. Thus to obtain a satisfying blooming, a low temperature period is necessary during the winter period. At the beginnig, I used no ferilizers. Around three years ago , I changed this way of doing and now I regularly feed my plants by adding some geranium fertilizer (relatively low in nitrogen and richer in phosphorus and potassium) to the watering at a rate of once every two or three waterings. Since I changed the method, I noticed both an improvement of the vegetative growth which doesn't completely come to a stand in winter, and above all, a much more abundant and vigorous blooming. However one shouldn't use too much fertilizer, which can weaken the plants. So I think that to get flowers, plants have to be well fed. For these too, I tested several methods : the first one consists in stopping all waterings whatsoever between October-November to let’s say February ; the plants have a withered aspect before the resuming of the waterings but their growth quickly picks up again after the first waterings . The second method consists in sprinkling slightly during all winter once every three or four weeks. As for flowering, I did not observe any significant difference between the two methods and I adopted the second one because the vegetative aspect of the plants is more pleasant and also because I can continue my fertilizations in winter. I was surprised to notice that a repotting with the replacement of the old compost by a new one produces an acceleration of the vegetative growth to the detriment of the blooming which will be disappointing the year following the repotting; but, everything is back to normal again one year later. On the other hand, when the compost is too old, blooming decreases even with the addition of fertilizers. 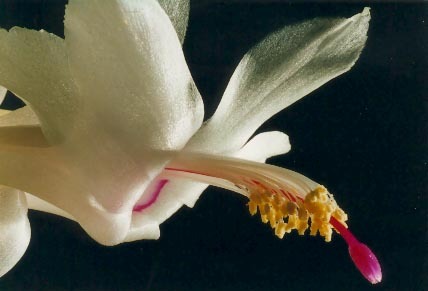 Schlumbergera or Zygocactus : for this genus, the appearance of the flower buds is conditioned by the length of the night: flower buds appear only if this length increases sufficiently : in September or October in France. This explains the nonblooming of plants located inside the house and artificially given light in the evening. This also makes it possible to induce blooming during any period of the year by covering the plants with opaque cloches, thus simulating the sufficiently long length of the night. Moreover, the color of the white or yellow blooming Zygocactus is sensitive to the minimal temperature between the forming of the buds and the opening of the flower : if this temperature falls lower than let’s say 15°C , the white or yellow flowers have a pinkish colour, the intensity which increases with the lowering of the temperature. Besides, the mixture of white or yellow and pink colors can produce a very beautiful effect. Personally, as I aim at putting photos of pure white and pure yellow flowers on my site, this year I kept the minimal temperature to approximately 14°C as it is written in some books. Obviously, I brought the temperature too low as you can see by looking at my photos (see for example the white hybrid “Bridgeport” and the yellow hybrid “Gold Charm”). I am not even sure that the minimal temperature of 15°C is not too low to obtain a pure white as on the photo which illustrates this page, photo of a plant I bought in a garden center as it was already in full bloom. Cryptocereus anthonyanus : I grew this plant for 11 years before seeing its first flowers. At the beginning, everything was normal as this plant is wee-known to bloom only when it reaches a definite size. After these first years, I tested several contradictory methods concerning winter waterings, winter sunny or shaded location of the plant, and the use of fertilizers. The first flowers appeared (but maybe it is only pure luck) after a sunny located wintering during which I kept watering and using fertilizers. Selenicereus : At the begenning, they didn’t want to flower in my collection. So I put them in a sunny place of my greenhouse; for two of three years now, they've started blooming.